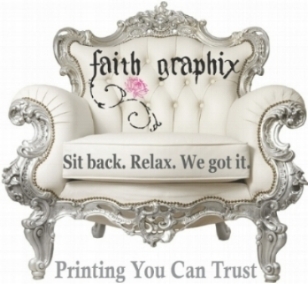 Faith Graphix is committed to providing our customers with top quality products. Because of this, we offer our no hassle Print Guarantee. If at any time you are not satisfied with the quality of the finished print product we provided, simply call Customer Care at 1.262.997.4815 to speak with someone in our customer care department. Low quality files/images affect the finished print product and cause the print quality to appear inferior. It is the customer’s responsibility to provide hi-resolution images and print files. General user error in selecting a product for order, to include improperly selected: print size, quantity, finish or product. Spelling, punctuation, graphical errors or other grammatical errors made by the customer and/or approved by the customer for print, regardless of whom provided the design. All print has been approved by you or someone authorized by you, prior to printing. Incorrect file sizes provided, files with no bleed, file orientation, or files submitted that are not in accordance to the specifications we provide. Incorrect file layout provided by the customer. To include but not limited to: folding, scoring, drilling, perforation, die cutting or other services. Incorrect shipping information provided by the customer. Damages that occurred after the product was delivered. Any and all other customer related errors or errors caused by acts that are out of the direct control of Faith Graphix. We reserve the right to request that you return the entire order at our cost of shipping, prior to reprints or refunds issuance. In the event that the order in question has time constraints, we may request that you provide full payment for the new order and we will refund the payment once we have received and reviewed the order you have returned. If after receiving the returned order, we determine that the order did not fall into our Print Guarantee guidelines, you will be held responsible for payment of both orders and we will return the original product back to you, as received. The guarantee value is limited to the reprint of the product, or a refund of the original purchase price. We are not responsible for any costs associated with a delay in receipt of the order, which include damages and/or claims incurred by you or your business as a result of the any delay. We are not liable for damages or claims caused by receiving printed materials that are defective, incomplete or items that are delivered after the estimated delivery date. Faith Graphix is committed to delivering quality printing in accordance with Industry Standards. Therefore, we guarantee that if your job has defects in workmanship or materials within our control or if we fail to follow your written instructions, we will reprint the job at our expense upon receipt of returned merchandise. This guarantee does not apply to errors in customer-supplied digital files, including, but not limited to, poor or low resolution photographs, improper color model, missing fonts, defective file formats, incorrect copy or corrections that were not noted on your proof approval form. While we do strive to assure “pleasing color” standards, we cannot guarantee the printed piece will exactly match the colors on your screen or printer. Call us immediately to discuss what you think is not satisfactory about the job. If we agree that the problem is our responsibility, we will give you written authorization for obtaining a reprint. Email us pictures (info@faithgraphix.com) of the defective product one up close and a group of 10 or more on a table. We will produce and send you another proof for your review and approval. Once we receive an approved, final proof, we will reprint the job as quickly as possible. We will ship you the new pieces at our expense.